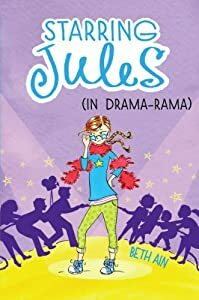 Jules is back starring in Starring Jules (in drama-rama) ! Shooting a pilot does not mean what you think it means. On TV, people live in mansions and have drivers! You get to completely change who you are, which everyone but me thinks I can do. You might have to miss the moving up play at school, which no one but me cares about. I love this character and this book, not only because it is the same nickname that my daughter has, but also because the author itself did a great job drawing the reader in through humor and great characters. This girl gets into so many situations and reminds me some of my own daughter. In reading this to my daughter she keeps asking when the next book will be coming out. While I don't know the answer of that I will say that we loved this book and definitely recommend it to all young readers!